On an icy February morning, Rhe Brewster, an emergency room nurse with a nose for investigation, is called to a dock in the harbor of the small coastal town of Pequod, Maine. A consultant to the Pequod Police Department, Rhe is responding to a discovery by one of the local lobstermen: a finger caught in one of his traps. The subsequent finding of the body of a young girl, wrapped in a sail and without a finger, sends the investigation into high gear and reveals the existence of three other missing girls of the same age, plus a childhood friend of Rhe’s. Battered by increasingly vitriolic objections from her husband, the pregnant Rhe continues her search, dealing with unexpected obstacles and ultimately facing the challenge of crossing an enormous frozen bog to save herself. Is the kidnapper someone she knows? 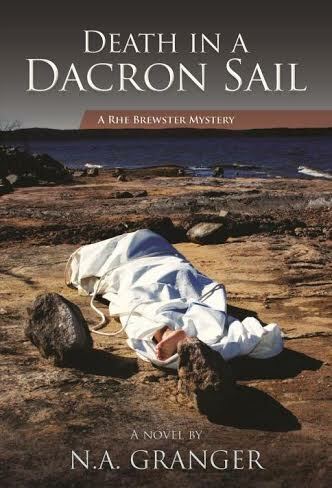 In Death in a Dacron Sail, the second book in the Rhe Brewster Mystery Series, Rhe’s nerves and endurance are put to the test as the kidnapper’s action hits closer to home. Death in a Dacron Sail is N. A. Granger’s second novel. It features the same main character as her first book, Death in a Red Canvas Chair, Rhe Brewster. I asked Ms. Granger to tell us a little more about Rhe. I also asked her why she writes crime fiction. Watch out for N. A. Granger’s great Blog SaylingAway, where you will be able to read an excerpt from Death in a Dacron Sail very soon, in December, before it’s published in January. N. A. Granger writes great crime fiction. Read my review of Death in a Red Canvas Chair. Why not read it now, before Death in a Dacron Sail comes out in January? ← ﻿Bite Size Memoir – It Made My Day!